carved valleys, and spread out the plains. bestowed on the world his light. with a love that spans all time and space. Yes, created me with a special plan for all my days. forgave me all of my sins. his Spirit to dwell within. And now he lives in me, and he gives me a reason to sing. Yes, abides in me; my Creator, my Saviour and King. To God be the glory, he is my reason to sing! What an awesome thought! The God who created this world, this universe, and things that I can’t even see or imagine, loves me! To think that before I was even born, he knew me, and he had a plan for my life! Psalm 8:3,4 When I consider thy heavens, the work of thy fingers, the moon and the stars, which thou hast ordained; What is man, that thou art mindful of him? And the son of man, that thou visitest him? Psalm 104:33 I will sing unto the Lord as long as I live: I will sing praise to my God while I have my being. AMEN DEB!!! 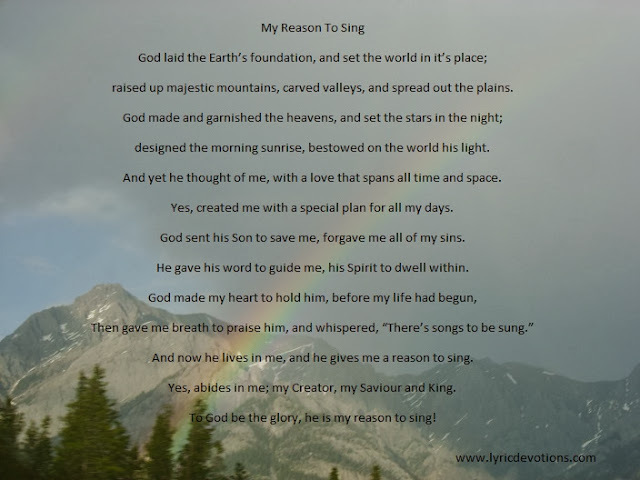 We do all have a song in our hearts to sing unto the LORD!